Almost every American household has at least one TV. Whether you use yours a lot or a little, you have to put it somewhere. But unless you want to feature it as the centerpiece of your home’s décor, decorating with a TV can be a real challenge. Happily, there are ways to put that screen in its place without compromising style. In fact, decorating with a TV can be a way to show off your personal style. So let’s get creative. The following tricks are sure to spark your imagination. If you live in an apartment or a tiny house, there’s a bonus here: Many of these tricks for decorating with a TV are also great ideas for maximizing small space and making rooms appear larger. And if you’re a renter? Just ignore the built-ins and zero in on the other tips. Mount a decorative shelf under the TV or surround it with shelving to house your media components, knick-knacks, books — whatever makes the room say “you.” Make it an entire wall of built-ins or use a few floating shelves to give your room a sleeker, more open look. Forget the shelves and create a gallery wall that surrounds your TV with artwork, memorabilia, etc. Go high or go low to draw the eye further from your TV, hanging items all the way to the ceiling or floor. Many designers recommend a combo of 1 and 2 so you can vary textures and visuals coming off the wall to create a pretty visual effect – it doesn't necessarily need to be one of the other! Mount your TV so that it appears to be floating on a focal or accent wall. Mix it up with a pop of color with paint, introduce pattern with wallpaper, or add a cool texture to the wall with shiplap or a chair rail detail. Mount it above the fireplace, where it will share the limelight. Mount your TV into a bookcase or console. Casey and Bridget of The DIY Playbook blog do it right in the example below where they updated a condo to perfectly fit their client's style! Put your TV in something unexpected — Any furniture with an interior shelf will work, from an old-fashioned secretary or armoire to a dresser or wall-hung cabinet. You can repurpose a stunning antique for this, or pick up an inexpensive find and DIY it to match your décor, no matter what the style. 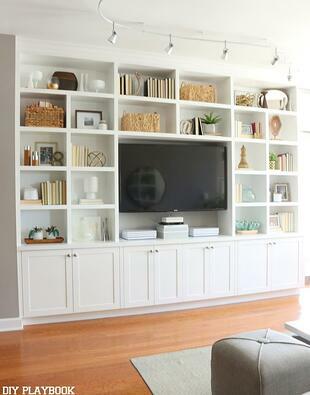 We love this easy to conceal example from Ballard Design of their Shutter TV Wall Cabinet. Check out the latest “mirror TV” innovations. New technology constantly changes the ways TVs can be used in homes. If you use your TV frequently, don’t get so creative that it becomes a chore to unearth it every time you want to watch, then “put it to bed” afterward. And don’t forget that, decorating considerations aside, your #1 goal is the perfect viewing environment. 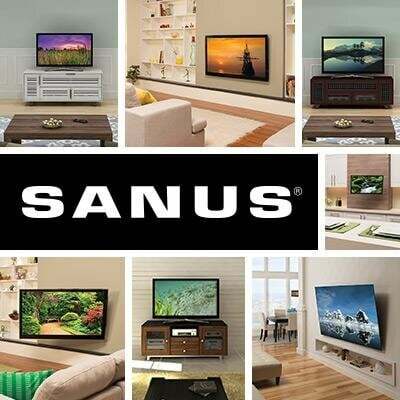 SANUS makes TV mounts that help you achieve the best — and most stylish —balance.